The latest wave in the long running Spawn series of action figures has begun to hit shelves. 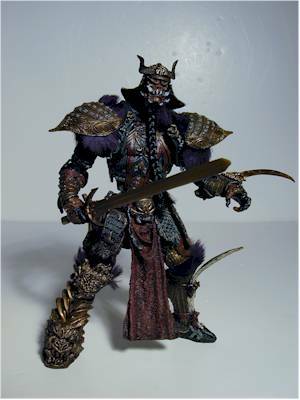 These figures are part of the Dark Ages theme, and are titled the Samurai Wars Series. 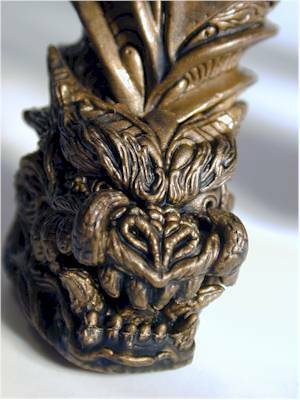 The figures are based on feudal Japanese characters, including a large, three headed dragon. I picked up the main Spawn character, Samurai Spawn, and the big bad Jyaaku the Nightmare. Jyaaku is so large he cannot be carded, but is instead boxed, and is more expensive than the carded figures. The carded figures are selling for about eight bucks, while the dragon is $15. The graphics are attractive on both the cardbacks and the box. On the back are pictures of the rest of the line, plus some basic background information. It's a pretty standard story, but at least there is some sort of background. Too often we get unique figures with no information at all. Unfortunately, McToys continues to amaze me with the number of twisty ties used. Jyaaku has at least a dozen! The strongest suit for McFarlane Toys has always been sculpting, and this series is certainly a perfect example. The level of detail on the heads, bodies and costumes is simply amazing. 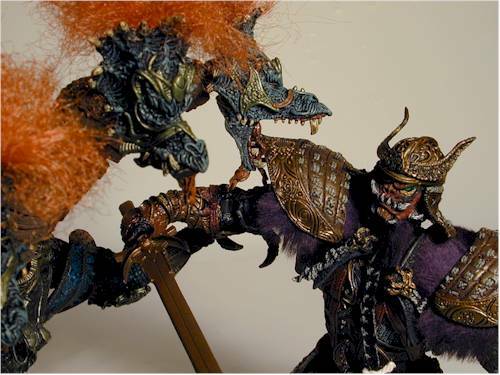 Of these two figures, Samurai Spawn is particularly eye catching. The details on his uniform are exquisite, and that's a hell of a word to use when describing something so pedestrian as an action figure. But this level of detail is as close to art as you can come in an eight dollar 'toy'. 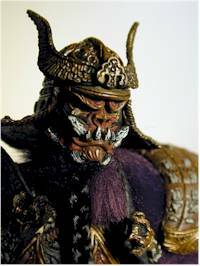 Jyaaku is also excellent, and the small details on the elbow, knee and shoulder pads are amazing. Every millimeter of these figures is minutely detailed, and while I am rarely amazed, McToys has managed to do it this time. The fur on Samurai Spawn is great. I pokes out just where it should, and looks terrific. The braided beard is well done, and the addition of a different type of material works with this piece. 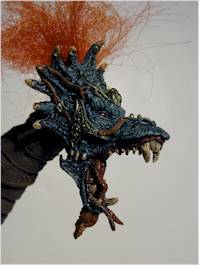 One negative - I could really do without the red hair on the dragon heads. Perhaps Jyaaku just reminds me way too much of Danny Bonaducci. McFarlane Toys is so psychitzo when it comes to articulation. One line can be nothing more than little statues, then another can be terrifically articulated. Fortunately, this series of Spawn is the latter. If I had only picked up the Samurai Spawn, you'd see four stars here. He's got joints up the wazoo, and they are useful, well designed joints. He has an excellent ball jointed neck, ball jointed shoulders (with moving shoulder pads to allow for full range of motion), elbows, cut joint wrists, jointed waist and chest, ball jointed hips, and knees. The ball joints used at the shoulders and hips are very unique as well, acting as both a ball joint and a cut joint. This allows full motion through all axis. The left knee has a similar design, allowing the left lower leg to rotate. If you look at these joints, you can see that they look a little odd, but since this figure is covered with a costume, they work perfectly. Jyaaku is also highly articulated, but unfortunately he is why they lose a half star. His necks are bendies, but the armor is designed to separate and return to position as you bend his head around. This is a terrific design, and allows for more movement than you might expect just by looking at him. Each neck also has a cut joint at the base, and a joint at the very top near the head. The arms have ball jointed shoulders, elbows and cut joint wrists. Each leg also has a ball jointed hip, knee, ankle, and what must pass as a calf joint on a dragon. The cut joint on the tail (which is also a bendy) and the check joint round out the amazing level of articulation. So why the loss of a half star? Simply because the joints on Jyaaku are hurt by the sculpt somewhat. I had a very tough time finding any good poses for him, and he has a tough time standing, even in the three legged pose pictured on the box. Jyaaku needed something - that's why they lose a little in this category. The sword that comes with the Samurai Spawn is excellent, and fits in his hand perfectly. Some folks are unhappy that there will be additional accessories offered for these figures through the Collectors Club as a separate pack. I'm not one of them. I think it's a great idea, and if done correctly will allow for some cool accessories that you might have had to buy some unwanted character to get. This way you can get them all, and since each character (other than the J-Man) comes with at least one decent accessory, it's not such a bad deal. 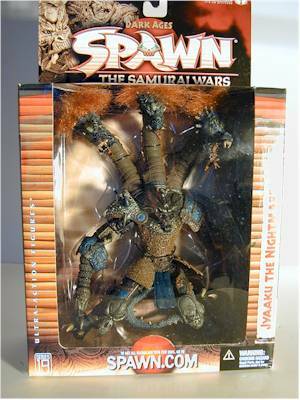 However, I did notice that the costume pieces for the back of Samurai Spawn, pictured on the card, are part of this pack. I'm assuming that accessory is only useful with that character, and packing those type of specific items in some generic pack is a mistake. Stick with other swords, knives, shields and other general items that any character can use. Yes, a piece of Samurai Spawn's armor did fall off once I got him off the card. But it wasn't too bad, and Jyaaku seemed to hold up to my twisting him around extremely well. Quality has always been an issue for McToys, but it looks like they have it licked for this line, at least. 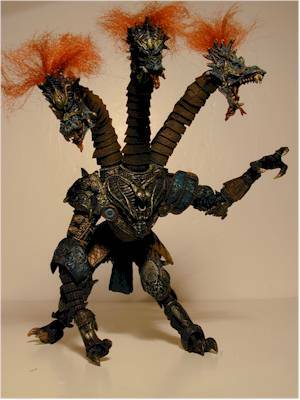 Someone asked me recently if I no longer liked toys from McFarlane, since I don't seem to review too many of them. Actually, I still do buy most of their movie related items, but it's been quite awhile since I liked one of the general lines. I'm happy to say that Spawn 19 is the first line in some time to show the creativity, quality, articulation and sculpting that McFarlane Toys is capable of all at the same time. Wal-mart received the carded figures first, but I've only seen Jyaaku at Toys R Us so far. Target has McFarlane stuff on clearance right now, so if you are really lucky, you could end up finding them there already on sale! - Entertainment Earth has a case for $99.99, which is about $8.25 each not including shipping. With a line like this, you're really better off picking them up at your local store unless you are concerned about finding the female figure.